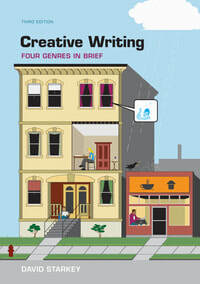 In my creative writing class we will explore the four genres, creative nonfiction, poetry, drama, and short fiction. We will study some models of traditional and more modern/experimental writing and discuss the elements and craft of written expression. By the end of the semester you will have completed several pieces and received verbal and written feedback from your fellow classmates. Finally, we will discuss how you might get your work out into the world, especially how you might find the right markets for your writing in literary journals, online publications, or other formats. Please purchase the textbook pictured below, a sturdy notebook that will serve as your writing journal (I like Moleskine notebooks but any will do), and, recommended but not required, a good grammar handbook such as The Little, Brown Handbook or Diana Hacker's Rules for Writers. Additional course information and first-day handouts below. During week 3 you will submit your first finished writing project. Your finished nonfiction piece should be 4-6 pages in length and can be narrative nonfiction (true story), a meditative piece (like the "animal/insect assignment"), or a piece written in "snapshots" like the exercise we will do in class on the body. If you'd like more ideas for nonfiction prompts, your textbook lists additional ideas on pages 222-225. ​As you work on your nonfiction piece, read/study the examples in your textbook and on Brevity Journal's website. Notice the range of voices, styles, and subjects. If you're still undecided about a topic, my best advice is to simply tell a story that's close to your heart. Tell a true story that you feel needs telling, for whatever reasons you deem important. Another source of inspiration is to find a nonfiction piece that you admire and mimic it in some form. ​1. Are you writing about something that is true--as true to the facts of your memory as possible? ​2. Have you written in a voice that feels natural, a voice that you might use to talk intimately with close friends or a group of trusted peers? ​3. Have you written with vivid, concrete details? Can you replace general examples for more specific ones? ​4. Can you add additional reflection? Good creative nonfiction includes the author's thoughts and reflections as well as a description of events or story. ​5. Nonfiction can be poetic. Metaphors and similes help to put your stamp on the subject you're writing about. ​6. AVOID CLICHES. If you're writing about a familiar topic, search for the angle that others may not expect. If you're writing about your grandmother, don't describe her as merely a sweet old woman with a heart of gold who baked the most delicious cookies anyone has ever eaten. Even if that is true (probably it's not), That would do her a disservice because it would not capture her unique personality. ​7. Allow your writing to be playful. Imagine that nobody will see this except for you. Take risks, Dare to write your piece in a way that nobody would expect. ​8. Read your piece aloud. How will others hear it? What can you improve or omit. Be tough on yourself. ​9. Don't be too cute, too clever, or too cool. Even if the piece is humorous, keep yourself in check. Tone it down, stay focused on clear expression and good story. ​10. Edit, edit, edit, but don't edit the life out of your work. Don't extinguish the original sparks that brought it to life. ​10. Proofread. Polish it up! ​--Looking forward to this first round of work. Good luck and happy writing!